Morata, M.; Gil, I.; Fernandez-Garcia, R.
This paper presents a novel approach to design a parametric RF stop band pass filter based on Low Temperature Cofired Ceramic (LTCC) Technology. The LTCC technology enables to miniaturize and development compact structures using not only the standard xy-planar circuit dimensions but also the z-height dimension. The proposed filters topologies are based on a stripline loaded with one or several complementary rings resonator CSRRs). Specifically, a parametric study z-location of the stripline respect to the CSRRs is carried out in order to determine the optimum configurations operating in the Ku-band. 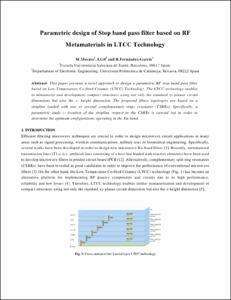 Morata, M., Gil, I., Fernandez-Garcia, R. Parametric design of stop-band-filter based on RF metamaterials in LTCC technology. A: Progress in Electromagnetics Research Symposium. "Proceedings PIERS 2012". 2012, p. 813-817.